Customer testimonials have long been a staple of our marketing efforts. We tweet them, we have them sprinkled all throughout both the marketing site and the app itself, and we even have a Wall of Love dedicated just to this. But if they’re so valuable, why are most marketing sites completely void of them? Because folks don’t ask their customers for them. They just wait for them to randomly trickle it. But Johnny, that’s not how it works! So many founders get all socially awkward and get scared to just ask their customers for things. Your customers want to help! They’re paying you because they like what you’ve done! Over the years we’ve tried a number of ways to collect these. Email can work fine, but it’s easy to lose track of them and keeping up with all the replies and attachments can get pretty cumbersome. It’s also harder to automate emailing your customers so you’ve got a steady stream of testimonials. We’ve now got a great automated system in place and have hundreds of testimonials that we can pull from for any purpose. Here’s how you can get the same system in place. First, you need an ongoing, automated way to reach out to customers. 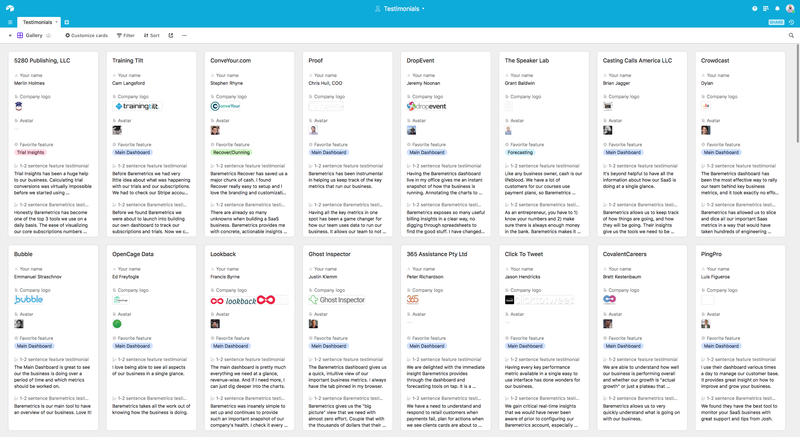 We’re big fans of Intercom and use them for nearly all of our messaging. Now, we could just have folks respond via email, but like I mentioned earlier, that gets really difficult to manage over time. We’ve tried copy/pasting responses in to a text document before or posting them in Slack, but really a spreadsheet works best. I’ve found that using an actual form to collect responses results in much more consistency and makes it really clear what we need. We ask for a handful of practical bits (business name, their name, company logo and an avatar) then we ask for two testimonials. The first is feature-specific. We ask what their favorite feature is and then for 1-2 sentences about how that feature has helped their business. The second is higher level, asking for 1-2 sentences about how our company or the product as a whole has helped their business. You’re specifically wanting to ask how a feature or your business has helped them. Just saying “write a testimonial!” results in non-specific answers that aren’t very usable. We use Airtable for the entire collection process. It’s like Google Sheets but…actually really great. You could also easily use Google Sheets + Google Forms for this, but seriously, Airtable is amazing. I’ve made an Airtable template (called a “base”) that you can copy and start using right away! Check out and copy the Airtable base, which is the main spreadsheet, the form and a gallery view of all your collected testimonials. 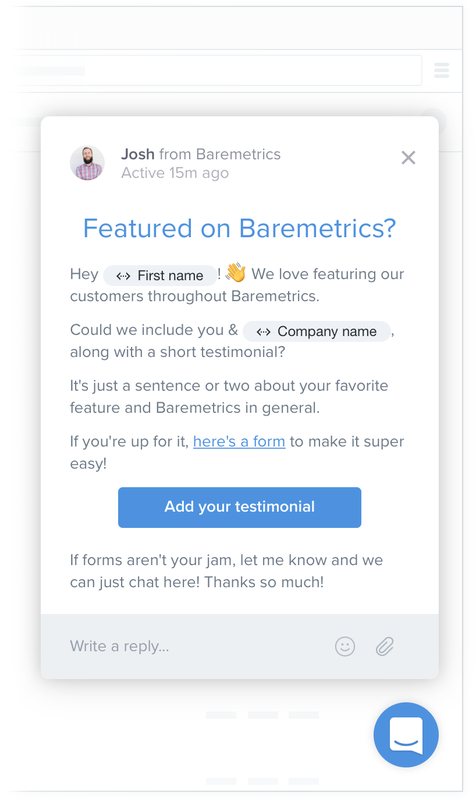 Here’s a preview of the form your customers would see to send in a testimonial. There’s even a handy “gallery” view to see all of your responses! 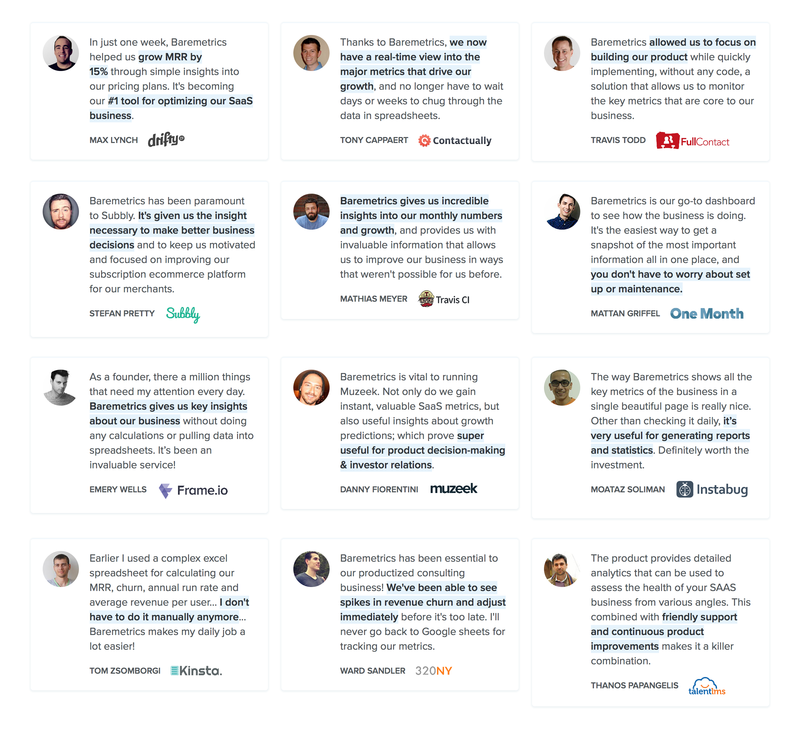 If you wanted to get real fancy pants you could hook up Airtable to Zapier and do automated responses to folks, send the responses to Slack, automatically tweet out testimonials or even send them to some sort of database to automatically display them on your website! And that’s it. There’s no reason you shouldn’t be collecting testimonials on an ongoing basis, and having an automated process in place makes that a no-brainer.